involves more than just filling an empty space with an assortment of outdoor supplies. the use of basic elements that would work well in any outdoor space. into an impressive sanctuary that reflects your tastes perfectly. Before you begin visually elevating your outdoor space to new heights, take some time to determine where the heart of your yard is. This may be the true center, or it may be a cozy nook in the corner. For many homeowners, a patio or deck is the main focus of a backyard. Essentially, the focal point should be where you spend the most time. This will be the spot where your guests look as soon as they enter your yard. Once you have an area for you and your guests to focus on, you can fill it. Choose one main feature that will create visual interest immediately. The main component you place in your backyard hub should attract attention as well as communicate a message to your guests. It should be the core of your design and should reveal the overall style of the rest of your outdoor display. Every backyard needs furnishings. Whether you use your yard for entertaining guests or as a quiet haven, you need some type of seating. If you have ever spent time browsing furniture catalogs or searching through outdoor supply stores, you know there are hundreds of selections to choose from. To avoid drowning in your options, break things down to the basics. You can always add to your collection as needed. The key items you need depend on where your point of interest is. If you are filling a patio, start with a couple chairs, a loveseat and one or two end tables. You can later add complementary items such as ottomans, coffee tables, rockers and dining sets. Outdoor furnishings come in a variety of materials including aluminum, wrought iron, teak and wicker. The type you choose depends on how you plan to use each piece. To create comfortable seating in other areas of the yard, you can add a swing, glider or bench. These pieces are ideal for viewing a garden, relaxing under the stars or soaking up some sun. No matter what type of seating you choose, keep comfort in mind. Some carefully placed plush cushions not only add beauty, they convey warmth, luxury and an inviting sense of coziness. The most subtle aspect of outdoor living is greenery. Every backyard boasts some form of plant life, including yards with artificial grass or full-scale sand gardens. Naturally growing plants, trees and bushes can be found in virtually any outdoor space. However, if your backyard lacks foliage, you can add your own with little effort. There are hundreds of gorgeous outdoor plants to choose from. To keep your yard looking magnificent, choose a variety of species that grow at different times of the year. After you select some plant life and flowers, you may want to spotlight your collection with various forms of lighting. Outdoor lighting is a design element that enhances a yard’s ambiance. Choose a variety of mood lighting such as hanging lamps, string lights, tiki torches and candles. You are limited only by your personal preferences. Lights placed throughout your yard instantly amp up its appeal. 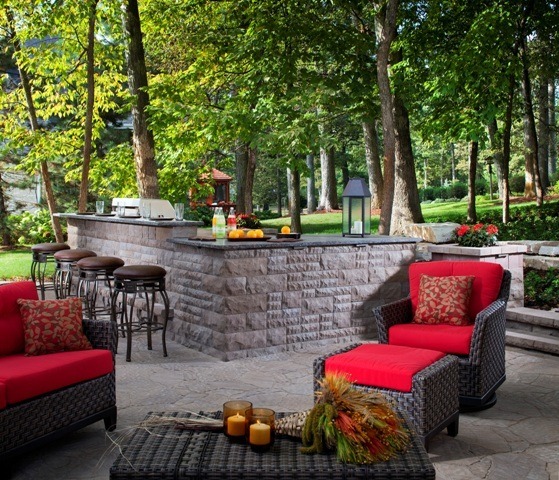 The finishing touches you put on your outdoor living space are what makes it your own. There are endless items to choose from including rugs, drapes, artwork, statues and table ornaments. These are the components that call for creativity. Have some fun filling your space with little pieces of you. By purchasing smaller elements as fillers, you can easily make changes every season. If you have the basics in place already, you can take your time adding the whimsical pieces of charm. You can create a welcoming and alluring atmosphere in your backyard by simply incorporating the basic features every outdoor space needs. Your family and friends will undoubtedly appreciate the retreat you present to them. Install It Direct can assist you with the details so you can be proud of your creation. Join our mailing list today for deals and insider tips on how to purchase and position these backyard essentials.